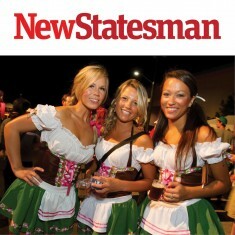 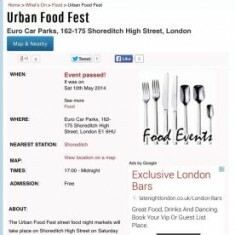 "An extravaganza of food, entertainment and live music"
"Gourmet global street food, craft beer, cocktails and more. 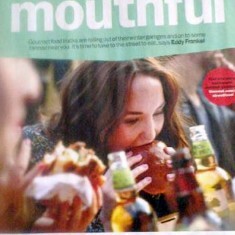 Turn up hungry." 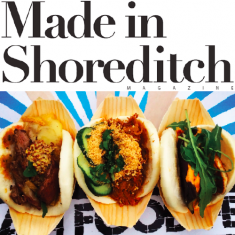 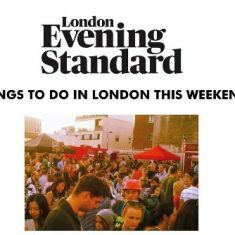 "Waves of deliciousness in the balmy outdoors"
"A cornucopia of street food vendors... everything from pizza to sushi"
"A taste of some of the best street food in London"
"The line-up is constantly evolving, so each week you’ll discover something new." 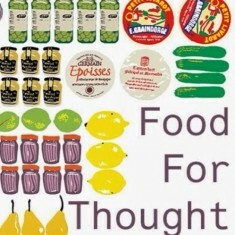 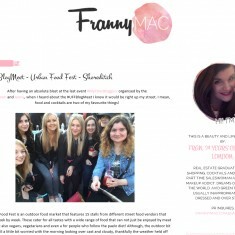 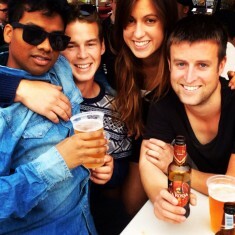 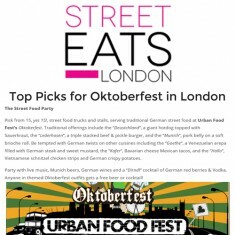 "Team the food with the varied alcohol on offer, and you're in for a street treat." 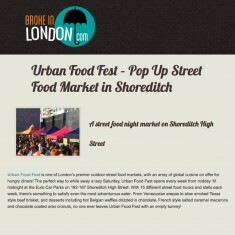 "Free-entry night markets full of gourmet street food... craft beer and cocktails"
"London foodies will soon have the chance to sample some of the latest kids on the gastronomic block"
"Offering a truly unique twist on the dining experience, Urban Food Fest is perfect for visitors with a curious palate who are looking for a laid-back, good time." 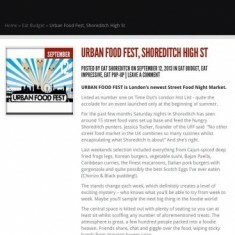 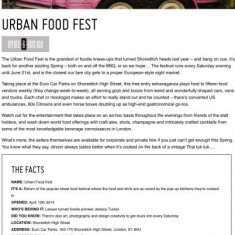 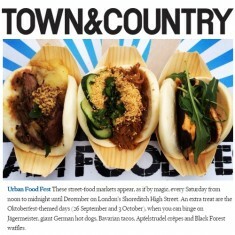 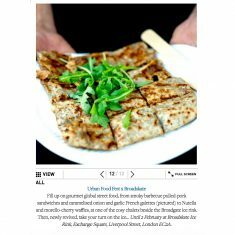 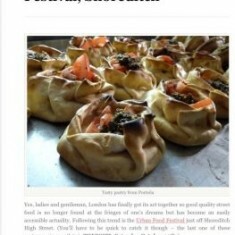 "The perfect way to while away a lazy Saturday"
"Great for a pre- or even post-Shoreditch pub crawl... and has a weekly changing selection of stalls"
"If you're a secret late-night eater, you'll love this - there's a night market catering for all your nocturnal foodie needs." 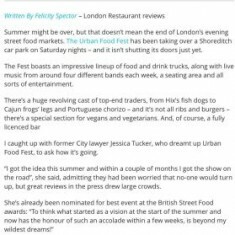 "The selection is second to none, the atmosphere and buzz of Shoreditch high street cannot be beaten...You simply have to check it out!" 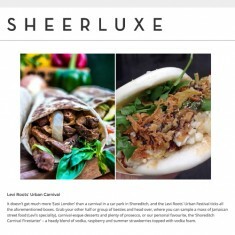 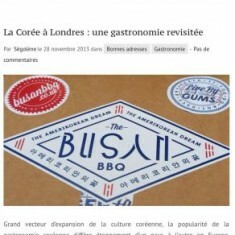 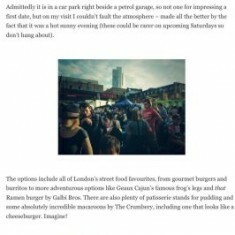 "Some of the best globally-influenced, artisanal street food in London." 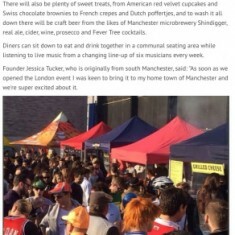 "Locally produced food, craft beer from Manchester microbrewery Shindigger and live music from a changing line-up of six musicians every week." 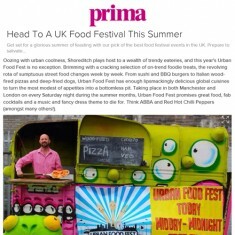 "An impressive line-up of food and drink trucks"
"Street food, craft beers and cocktails... a midnight feast"
"An array of new traders which even the most prolific of street food fans might not have sampled"
"15 different trucks and stalls... serving gourmet global street food dishes "
"Treat yourself to... street food delights... and speciality cocktails"
"The night market's ever evolving lineup ensures second and third visits are well worth the effort... trust us, you'll want to eat everything." 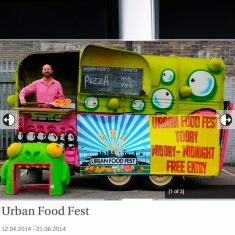 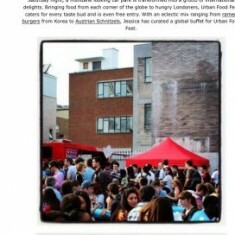 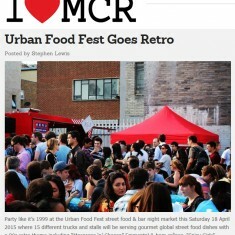 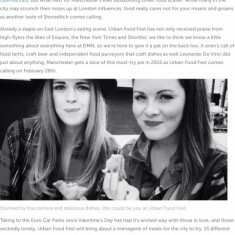 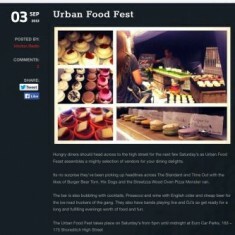 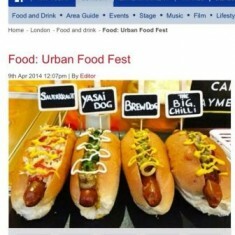 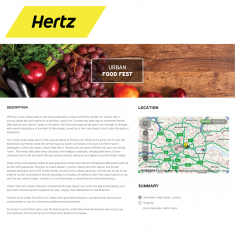 "A grotto of international delights, Urban Food Fest will leave you wanting to come back to try more." 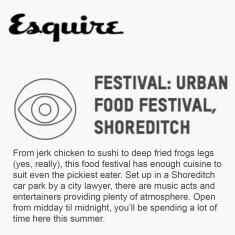 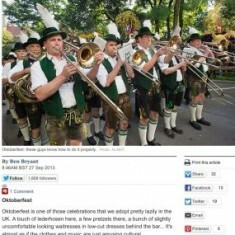 "Everything from tacos to frog's legs, and plenty of entertainment while you chew, you may find you never want to eat indoors again." 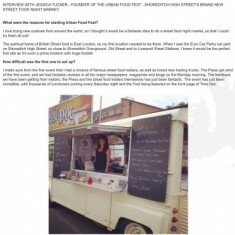 "The food was all lovely, the atmosphere brilliant and a great place to get together." 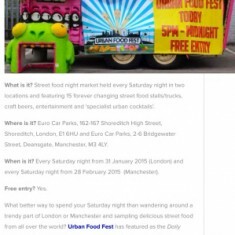 "15 different street food trucks and stalls serving gourmet global street food dishes plus premium drinks bars"
"Appetites for destruction will be satisfied and tantalised by all manor of culinary concoxions"
"Enjoy the street food party vibe, the great live music and stuff yourself with cheaply priced but yummy international eats"
"Eat budget, eat impressive, eat pop-up"
"A street food extravaganza..every Saturday night on Shoreditch High Street"
"Incredible atmosphere, a perfect night out"
"Levi Roots' Urban Food Fest "Carnival” themed street food market is featuring Levi Roots"
"Fifteen different street food trucks and stalls serving gourmet global street food dishes, a premium bar and cocktail bar, seating and live music"
"Street food, live entertainment and some rather yummy cocktails"
"An open air foodie wonderland... offering gourmet street food from around the world"
"Urban Food Fest is London’s coolest street food market, bringing together London’s hipsters to one location"
"Funky and quirky street food. 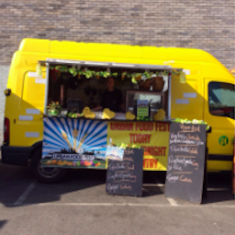 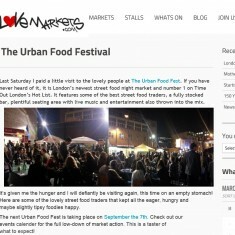 The best food market in town!" 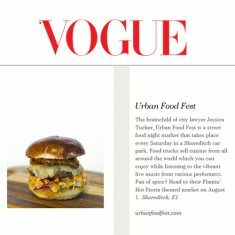 "Glorious... make this an essential visit"
"Bringing... all sorts of deliciousness to hungry fans of alfresco urban dining." 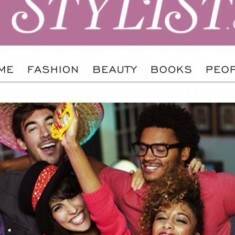 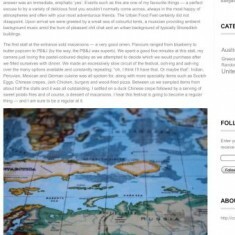 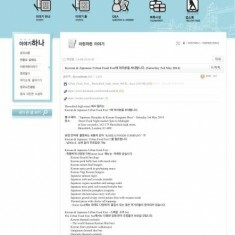 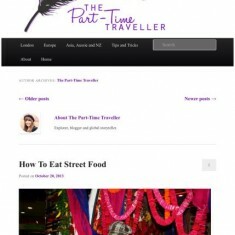 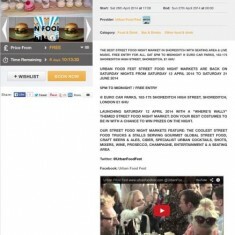 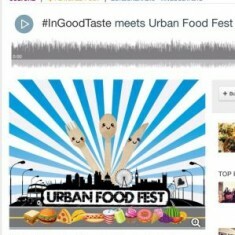 "Global gourmet street food, a premium bar & cocktail bar, plus live musicians & seating." 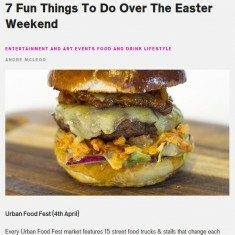 "Delicious food, great atmosphere, and a fun way to pass a Saturday are guaranteed." 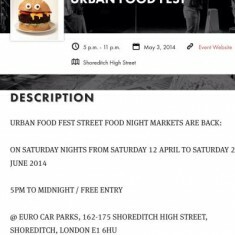 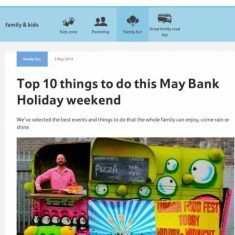 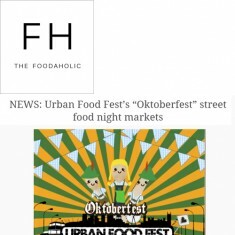 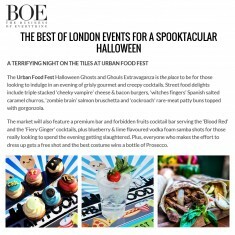 "Street food trading tucks and stalls, alcoholic and soft drinks, a seating area, entertainment and surprises throughout the night." 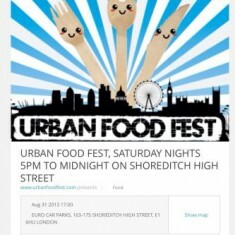 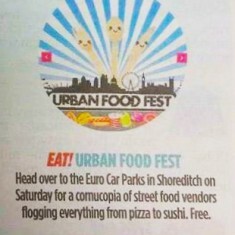 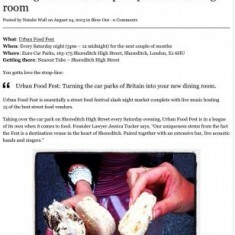 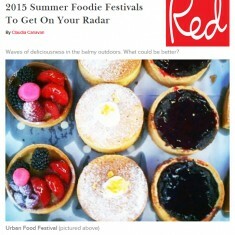 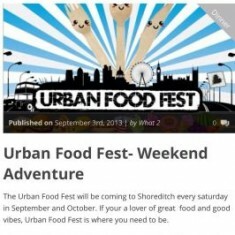 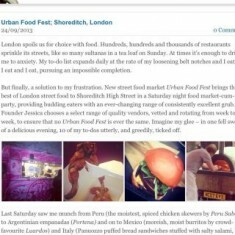 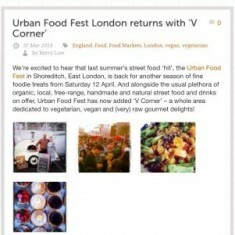 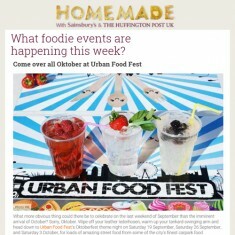 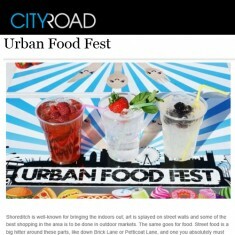 "Urban Food Fest is in a league of its own when it comes to food"
"A pop up with a difference... Urban Food Fest keeps it varied"
"Urban Food Fest embodies the spirit of the street food revolution, quickly establishing itself as the place in London to eat on the street"
"Filled with 15 different food trucks and stalls selling a selection of gourmet street food dishes, many created exclusively for Urban Food Fest"
"Urban Food Fest offers visitors the chance to enjoy delicious global street food, ethnic cuisine and craft beers, all in a late-night, laid-back environment"
"It doesn’t get much more ‘East London’ than a carnival in a car park in Shoreditch"
"Amazing street food from some of the city's finest carpark food purveyors." 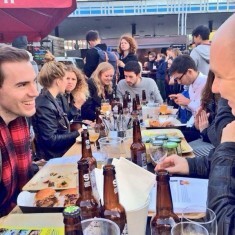 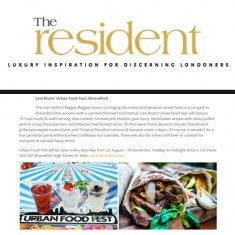 "A lively outdoor eatery with communal tables and tantalising scents wafting through the air... with a sensational range of international cuisines available"
"One of the most laid-back vibes in London Town right now, with live music, tons of great street food stalls and some great bars serving up craft beers and killer cocktails!" 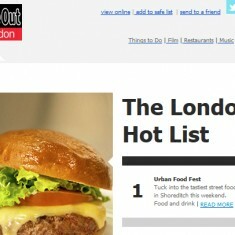 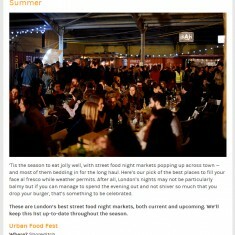 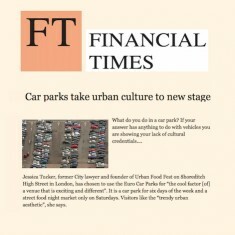 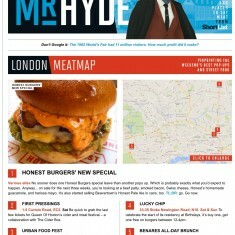 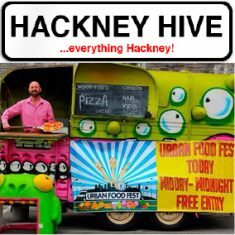 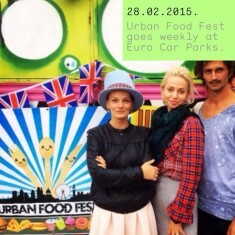 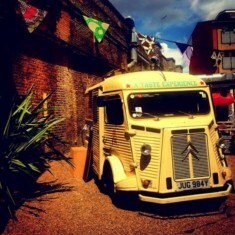 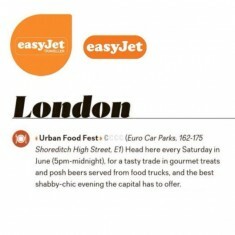 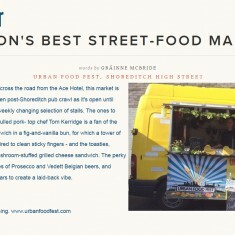 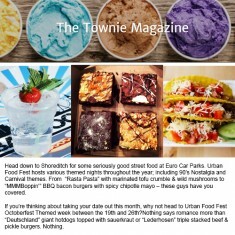 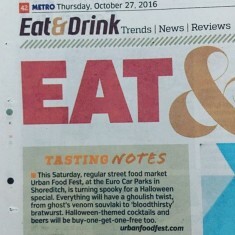 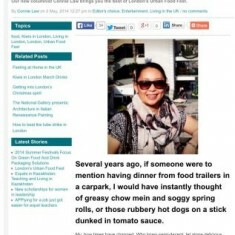 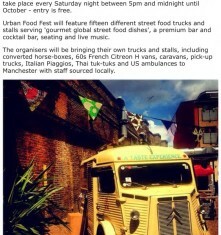 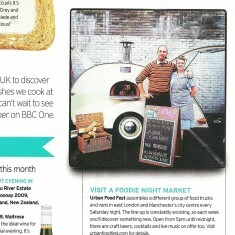 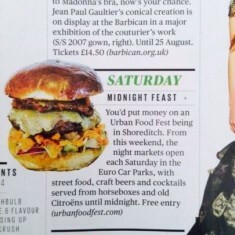 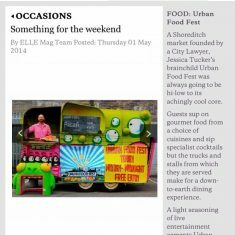 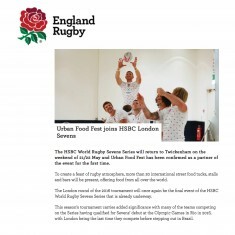 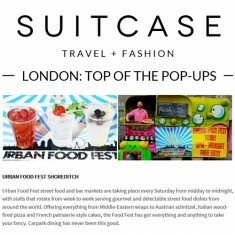 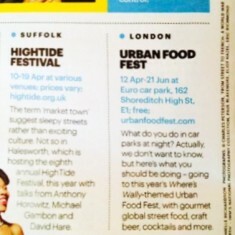 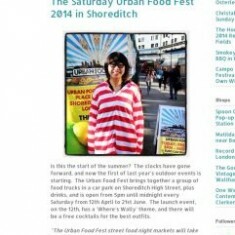 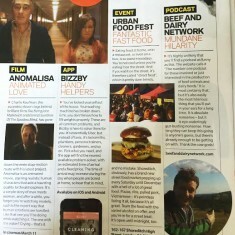 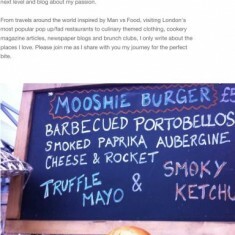 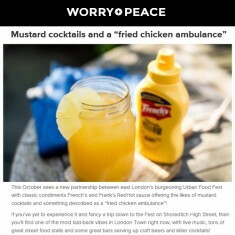 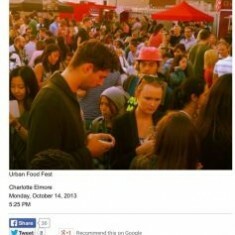 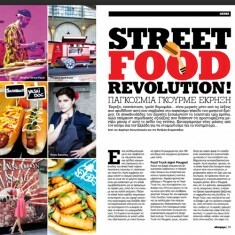 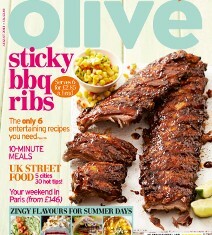 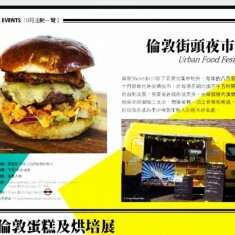 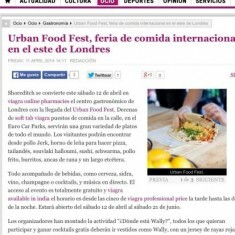 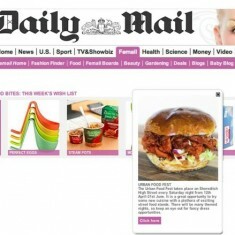 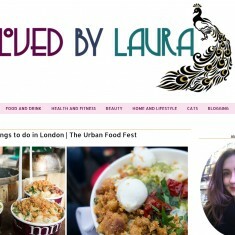 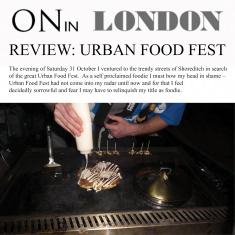 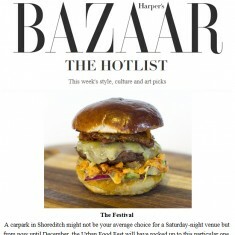 "An ever changing selection of London's street food trucks, as well as London's best stocked car park bar!" 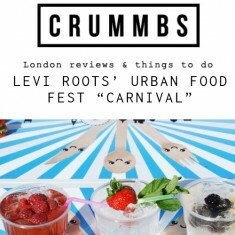 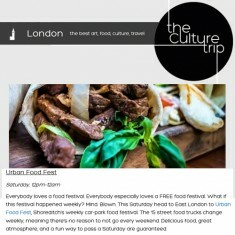 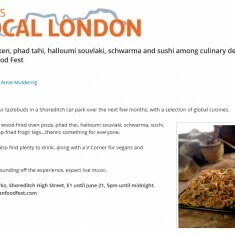 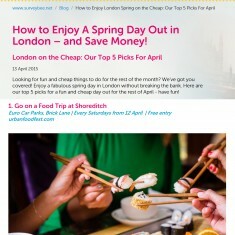 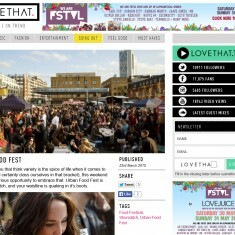 "Party with live music, beers, wines, cocktails... and street food trucks and stalls"
"Bringing live music... and street food to a car park in Shoreditch"
"Delectable street food dishes from around the world. 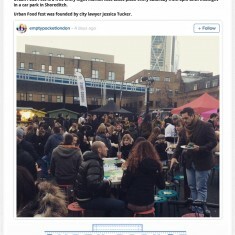 Carpark dining has never been this good." 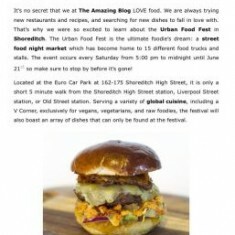 "Oozing with urban coolness... and brimming with a cracking selection of on-trend foodie treats"
"An extra treat... these street-food markets appear, as if by magic, every Saturday from noon to midnight"
"The best street food in Britain... an explosion of gastronomy"
"Urban Food Fest is the ultimate foodie’s dream: a street food night market which has become home to 15 different food trucks and stalls"
"The best tasting street food around town"
"A fantastic showcase for street food currently in the capital"
"London’s most popular street food market... a real treat"
"Hugely successful street food events which are known for their quirky gourmet foods and brightly decorated vans"
"Shoreditch becomes the gastronomic center of London with the arrival of Urban Food Fest"
"Big hitters of the street food world... make the decision of what to eat even harder! 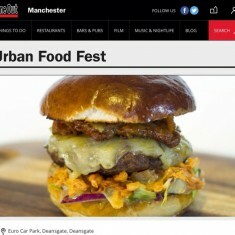 "A variety of delicious food you wouldn’t normally come across, always in the most happy of atmospheres"
"A vast array of global cuisines from Korean to Mexican, from Argentinian to Indian, with a bar, some music and dash of street art thrown in for good measure"
"Like nothing you’ve ever eaten. 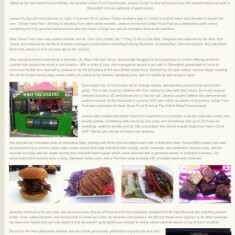 Every bite was accompanied by live music and DJs, every swallow washed down by cocktails "
"Car park dining never tasted so good"
"Some of the best street food , a fully stocked bar, plentiful seating area with live music and entertainment also thrown into the mix"
"The food was delish and there was plenty of choice"
"Food, cocktails, face painters and of course fantastic prizes for those who come in themed costumes"
"A street food festival with a mixture of cuisines"
"A siren's call of food tents, craft beer and independent food purveyors"
"New cuisines from around the world... thousands of Londoners come every Saturday night"
"World cuisines, ice-cold beers... plus plenty of seating to chill and relax"
"A colourful street food festival"
"Seriously good street food... these guys have you covered"
"A night market in the midst of super-cool Shoreditch... Urban Food Fest is the place to be for foodies"